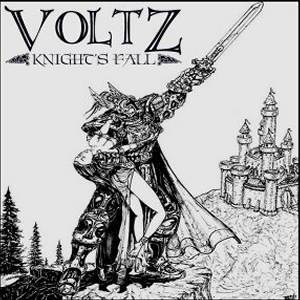 "An album which represented the "screw you, we'll do it ourselves" philosophy of the New Wave of British Heavy Metal - if not its customary sonic blueprint - Voltz' Knight's Fall was a largely independently financed and produced affair, complete with bottom-dollar recording conditions and a charmingly amateurish, hand-drawn cover featuring an armored knight with a swooning damsel in one arm, a sword hoisted high in the other, and a castle looming in the background. But metal fans of the day were in for quite a surprise once they dropped needle onto the vinyl album's grooves; for, as well as generous helpings of hard rock and metal found in the Quartz-like "Badon Hill" and the no-frills "Red Eyes," Knight's Fall was actually dominated by astonishingly mellow and melodious elements. And when combined with the band's template-free songwriting approach for ambitious material such as "After Armageddon" and "Years," these elements produced truly unusual results, arguably closer to progressive rock than metal - although stylistic parallels can be found in fellow Brits Witchfynde and, a little further away and a few years earlier, Wichita, KS originals Manilla Road. Moreover, Voltz didn't even bother to juice up their amps during lengthy, almost gothic-folk ballads like "In a Dream" and the title cut, but struck the perfect balance between their dark and light extremities on the standouts "Dorian Gray" and "The Rose." In the end, Knight's Fall was the sort of idiosyncratic work that had a few wide-eyed supporters embracing Voltz as the second coming, while the vast majority of metal and prog fans were simply left confused..."
...Well, the review quoted above is pretty much spot on, and I too was quite surprised to find this on the Vibrations of Doom archive of classic metal albums. Voltz (initially called Airline) are considered to be an NWOBHM band - however, there's not much metal in their music, even if I'm not saying it as a bad thing. Anyway, this is a very interesting obscure album, just don't expect something really "heavy" from it (although its cover art might suggest so).